In my early twenties, one hot summer day seen through an office window, I felt as if I should be getting out on my bike more. A flippant message to a best mate, "I'm going to cycle round the world". Would it become reality? The malaise of our early twenties affects us all in different ways, but Andy Welch, bored of the office trample, came up with a way of breaking out and hitting a trail of adventure. With his best friend, he decides to cycle around the world and follow the horizon to the end. After a year of preparation, with no experience of travelling or any idea of what to expect, they wobbled off together following the compass from their hometown for a journey of a lifetime which no planning could have prepared them for. Hitting the mountains of Armenia and the wild urban dust of Bucharest; the brooding Black Sea Coastline and the vibrant energy of Tbilisi; the duo experienced the world in ways completely fresh and alien to the path they were on. Two friends wanted to change their lives; they couldn't have changed them more. 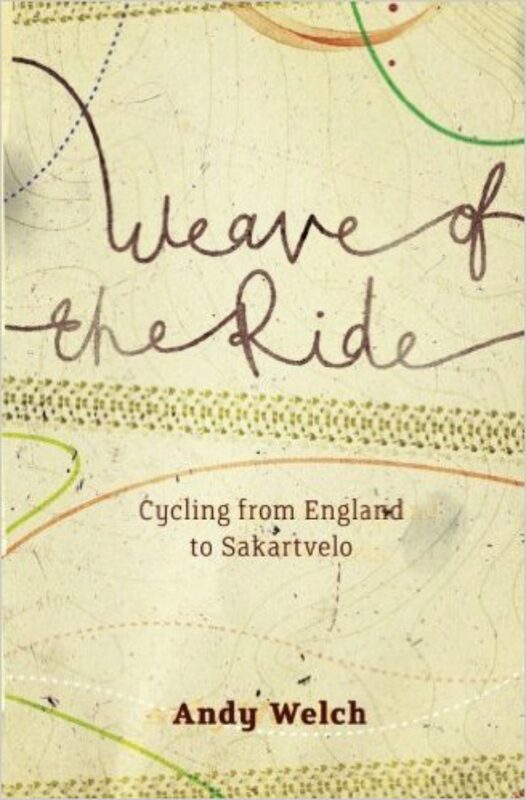 'Weave of the Ride' is a tale of friendship, disaster, love, and self-transformation, by bicycle, set against the backdrop of a world of friendly strangers, strange weather, wild dog attacks, and a tapestry of rich local culture and hospitality. Where On Earth is Sakartvelo? The Unpredictability of Life and the Weather. Weave of the Ride is close to me as it speaks about my personal encounters and conversations with different cultures on my journeys. My travels can be split into 3 major journeys between 2007 and 2010; Europe to Georgia, Georgia to India and Mongolia. I currently work as an open source software developer and write books and work on design projects. I live in London but I was brought up in a small Leicestershire village running around the fields having adventures. I studied Environment, Economics and Ecology at York and my passion for cycling began exploring the Dales and Moors in the mountain bike club. I have always been interested in philosophy and the journeying inspired me to study MA Design Critical Practice at Goldsmiths. In hindsight, although studying is important, ‘in the world’ experience is priceless. After I finished studying in York I decided to start a design business, but after 6 months, I was sick of being in front of a screen and I realised that I wasn’t ready to take on the boring aspects of managing a business so I got a job as a mountain bike guide on the island of Korcula in Croatia. It was a challenging and intense taking 3 rides per day on rocky terrain in the heat. Although tough it was satisfying but something was missing. Some friends hired a car and travelled round the island. When they returned, I saw their photos and it triggered a desire to explore on my bike instead of cycling loops. When I returned to the UK and got an IT job in a basement office near my hometown, I felt my energy disperse. After 6 months, I knew nothing would change unless I did something about it. I felt that the world was ‘out there’ and the bike was the obvious way to access it I could absorb a cross section of a country in a slow way and I could always bail out. My only aim was to have a massive adventure. Having discussed the idea with a former school friend; one sunny day, stuck in the office, I sent him a text saying ‘do you want to cycle round the world’ to which he agreed! Thus launched a process of preparation; I created a website with equipment we wanted and countries to visit. I began to craft my thoughts in a journal. We managed to source sponsored equipment from companies by being persistent and making many phones calls. The day of departure came. My wheels hadn’t arrived from the sponsor so I hadn’t even tested my bike yet. I was nervous because I wanted everything to run smoothly. Finally my wheel did arrive, I built the bike and we had a party to celebrate leaving. To my surprise the village and neighbours arrived and released balloons as we pedalled slowly out the village with a lingering hang over. We had left the safety of the preparation and ideas and were opened up to the process. It was a leap into the unknown. Not even out of England on the first or second night my friend Mark asked a stranger for water and we were very surprised to not only have our water bottles filled but also be invited in, given food and even a place to sleep. We continued to use this excuse to make connection and were regularly invited in. This created a dilemma of whether to accept the invitation at the expense of making the distance but we always accepted the invitations. We stayed with many families along the way. It was amazing how friendly and hospitable people always were. One of my favourite aspects was eating real local food in family homes because it was always so food. I stayed with people in Iran, Turkey, and even with the Pakistan police. I was always treated with respect and fed well. There were idyllic campsites by lush green mountains pastures in Switzerland, the smooth cycle superhighway of Europe, ‘the Danube’ with its history and spirit. Two English girls joined us in Budapest and Maria made it as far as Istanbul on the scrapheap bike she bought for 20 Euros. The brakes were rubbish and the seat was uncomfortable but it worked! It was hard to leave friends and family behind but there were always fascinating people to meet along the way. If we weren’t staying in someone’s house we were camping but some nights we couldn't find a spot and that once lead, Turkey, to sleeping in a bus shelter in the snow. My sleeping bag was summer graded so it was freezing. Mark left at Budapest and I ended up in Tbilisi at New Year on one of the coldest winters on record with temperatures regularly at minus 20. I hadn’t even heard of Georgia before I started the trip but it was like entering another world; a broody, wild, snowy, magical-place of dancing, shouting, drinking people. I fell in love with it immediately. My friend Tom met a girl in Armenia and decided to marry her leaving me to decide my future alone. I had harboured a dream to start my own mountain bike guiding company so I met some local bikers in Georgia and founded a company before continuing my ride onward through Iran, Pakistan, India and Nepal and then returned to Georgia. Having ridden on the roads for so long, I yearned to go beyond the ‘road culture’. The logical conclusion was to go somewhere where there were no roads, so in 2010 Tom and I went to Mongolia. My second book, which I just passed to my editor, covers the journey from Georgia through to Mongolia. The journeys I have taken have defined me. Such coming of age experiences can take any form but often there is dissatisfaction, a need to break from the norm and take a leap in to the unknown. 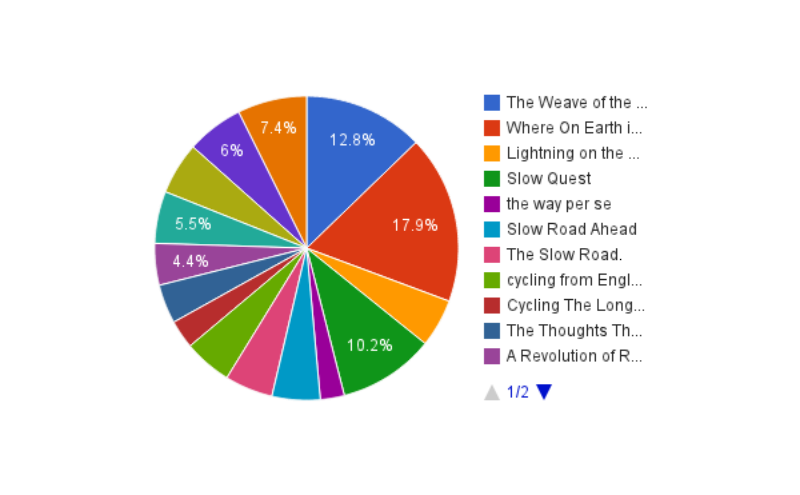 When I came to writing Weave of the Ride I was surprised at how good my memory was because the journey had connected every experience together in a much more meaningful way. I have a favourite quote by Alfred North Whitehead that says that ‘adventure is the vitality of ideas’. I think we live in a time where more than ever we need to not only have good ideas but act on them to get experience and learn from mistakes instead of opting for the comfortable, path of least resistance. That is the end of my speech. Thanks for listening does anyone have any questions? I have some books available for sale and for signing. What’s it like to ride into the unknown? • Riding into the unknown is both unsettling and life affirming. • It is hard to let go of connections to family and friends but there are so many valuable connections to make along the way. • Relationships were tested by the journey but they were also deepened, strengthened and allowed to grow. • We had planned a well-defined route across Europe, but once we had left we took many diversions from the route, whilst keeping an overriding objective of ‘riding East’. • We planned, in general, to the nth degree, but having left I realised how much excess stuff I had which resulted in me sending much of it back. • There were definite inspirations and reasons for travelling such as leaving the country to explore, because I loved to cycle, and an opportunity to take up photography, but there were many undefined qualities in ‘the search’ too. It was a search for meaning in life. How much did you spend in each country? • I intended to travel on a shoe string. In European countries I spent 5 euros per day. • In India more like 2/3 euros. • It was more expensive in tourist areas and if I didn’t camp. • I spent £3,500 over 7 months in Europe, £3000, over 9 months in Asia and £1,500 on the Mongolia trip. What did you eat? • Cycling is hungry work but I still ate cheaply. • I regularly ate bread, cheese, and tomatoes and lentil soup in the evening. • During the day I had snacks of dried fruit, nuts or biscuits. • I was given food along the way, like a bag of walnuts, plums or barbecued meat. • I wish sometimes I had spent more time eating in restaurants, but I regularly ate in people’s homes, and the food was always amazing. Bike? • I took a converted mountain bike but it depends what kind of trip you are doing. If it will be mainly on the road, then a road bike will be faster and more efficient. • If you are going somewhere where the roads are poor quality then a stronger setup will pay off.